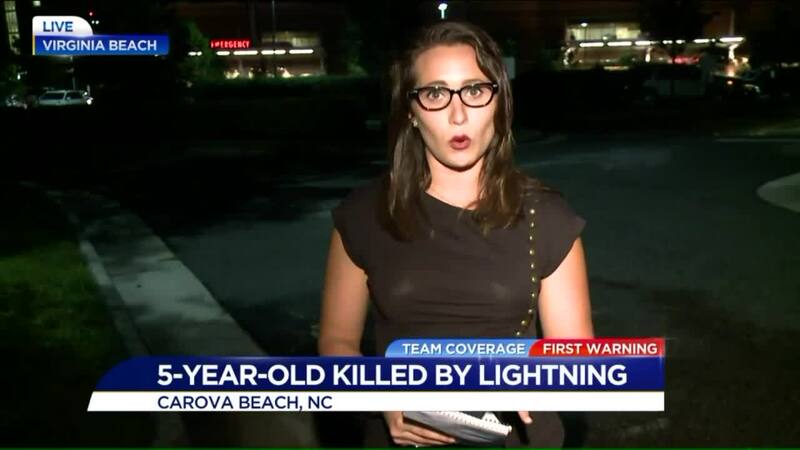 CURRITUCK COUNTY, N.C. (WTKR) - A 5-year-old boy died after being struck by lightning in Currituck County Sunday evening. Chief Ralph Melton, of Currituck Fire and EMS, told News 3 they were called to the 4WD area of Carova Beach around 4:10 p.m. on reports that a 5-year-old had been struck by lightning. Crews worked to save the child on the entire trip to Sentara Princess Anne Hospital in Virginia Beach, but the lifesaving efforts were not successful. The child suffered traumatic burns due to the lightning strike and was in cardiac arrest from the time of the strike until he was pronounced dead at the hospital around 6 p.m. According to Chief Melton, the child was a tourist visiting the beach with his family.